Studio of 20m2 with mezzanine, consisting of a fitted kitchentte, living room, sleeping loft, bathroom with toilet, double glazing, water. In perfect condition, kitchen, living room, 2 bedrooms, large balcony, cellar, bike room, open view, (possibility). 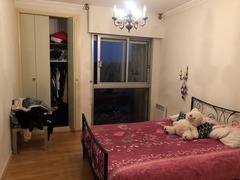 Studio with entrance, equipped kitchenette, living room, shower room with wc, double glazing, water, heating and electricity. Independent kitchen equipped and furnished (plates, refrigerator, washing machine), local with bicycle, parking. Living room with decorative fireplace, 3 bedrooms, cupboards.